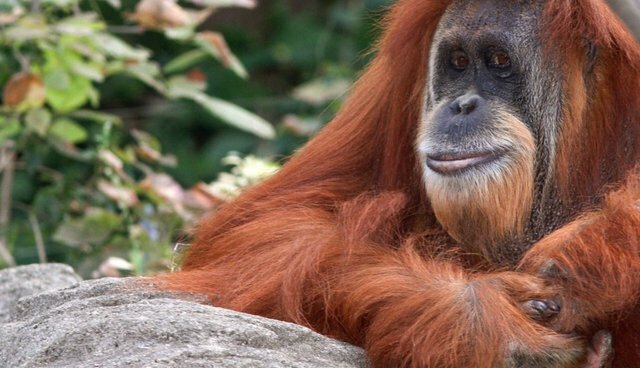 In early December of last year, keepers at the Oregon Zoo noticed that a male orangutan, Kutai, was lethargic and wouldn't eat. After a general examination and blood work, several surgeries were performed on him by zoo veterinarians, but on Jan. 4 Kutai died after being transported back to his enclosure. Now, an investigation is saying that human error was likely to blame for the orangutan's death. A report released this week by Metro, the government body that oversees the zoo, found that not only were errors made, but that zoo leaders didn't report them at first. According to the report, vets didn't have cardiac drugs or a "crash cart" available when Kutai's heart failed, an ultrasound machine was wasn't charged when they tried to revive him, and a medical assistant was caught sending text messages during the his last surgery and asked to stop. The news comes after the firing of zoo director Kim Smith and chief veterinarian Mitch Finnegan, both of whom were involved in the incident. The report also notes that the original investigation was sparked by an anonymous tip to an ethics line regarding misconduct on the part of zoo staff. The report also indicates a lack of consequences for employees -- no staff were disciplined as a result of the incident, and chief veterinarian Mitch Finnegan had only disciplined staff twice in the last seven years. Chris Pfefferkorn, deputy director of living collections, had openly described the mistakes around Kutai's death as "sloppy," but he never recommended an independent review.